All three splits were 10:08:x. I couldn't do that again if I tried! At around noon, my brother's girlfriend, Kendall, came over. She brought Panera for lunch (yum!) and we chatted for a while. We made plans for Nathan's race, which is a week from tomorrow. She's going to meet us in Detroit and go to the cheering stations with me, Jerry, and my sister. She left at around 4:30, and then at 6:30, Sarah and Ne came over for the evening. Her students had fall break all week, so she came home to Michigan for a visit. This morning, Noah had a cross country invitational. It was at a park that I'm very familiar with, because I run there sometimes. Jerry was off work today, so he got to go watch Noah for the first time. It was a really big meet, and there were a lot of kids there. Noah mentioned that there would be medals for the top 100 kids to finish, and he was hopeful that he would get a medal. I told him not to worry about it--that getting a medal is tough. I said that I've only "won" a medal twice (in my age group), and I've done 30+ races! The course was 1.25 miles today, and definitely tougher than the previous courses, because it had a big hill. I'm familiar with the park, because I run there sometimes; but I don't run the hill because I stay on the dirt/gravel trail. I told Noah that his pace would probably be slower this time, because of the tougher course. 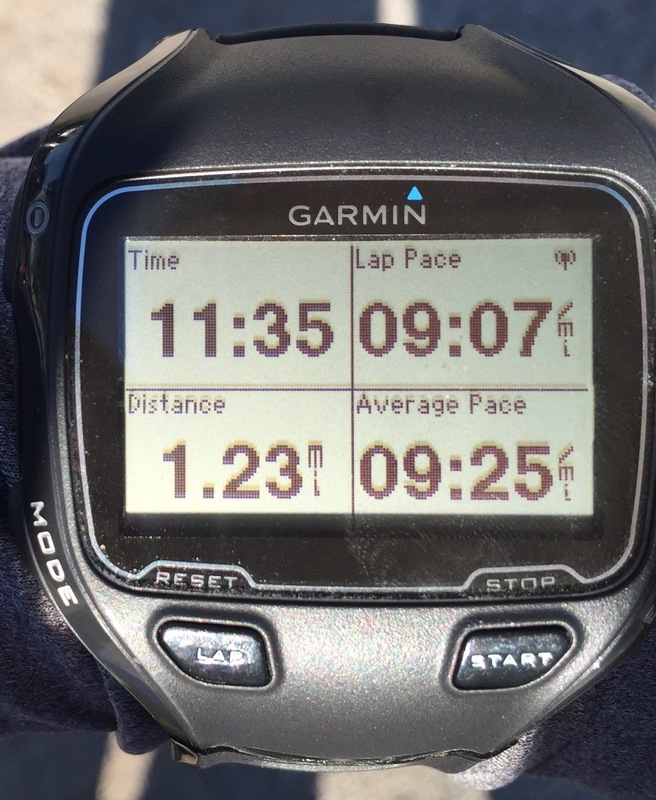 I let him wear my old Garmin for his race, which he thought was really cool. It made him feel special ;) I told him not to look at it at all the entire time he was running, because I didn't want it to distract him; he should just push the button when the race started, and push it again at the finish line. The kids lined up to start, and there were at least 200 kids there in his race division. They had the boys and girls run together this time, so it was a large race. As soon as the gun sounded, I was looking for Noah in the back of the pack, where he usually is, but didn't see him. My mom, Jerry, Eli, and I hurried to the top of the hill to watch the race from there, and to see the kids as they ran over the hill. When Noah came by, he looked like he was doing great! After he passed by on the hill, we went back down to the finish line to wait. While we were there, I saw my friend Renee. It's been forever since I've seen her, so it was awesome to chat with her, even though it was just for a minute. She's training for the NYC Marathon, which has been her dream race for years (she was supposed to do it in 2012, but couldn't because of Hurricane Sandy). Anyway, Noah came through and crossed the finish line in 11:35! He also asked me if I could write down my blog address on a piece of paper so he could give it to his cross country coach. I thought it was cute that he was proud enough of me to share it, so I gave him my business card, and he ran over to give it to his coach. I was a little embarrassed, because I didn't want her to think I was self-promoting! But Noah said he wanted her to know how far I've run, hahaha. This afternoon, I went to the thrift store to get an outfit to wear at the Purina event Tuesday. I didn't want to wear jeans and a sweatshirt, but I don't have many dressy clothes. After probably an hour and a half of sorting through clothes and trying things on, I finally found a good outfit to buy. Not too dressy, but not too casual. The pants I bought last month are too big, so I was hoping to fit into 8's this time. All the 8's I tried on ended up fitting, so I think being back on Weight Watchers is doing the trick. When I left there, I went to Dunham's to buy a shirt for my brother. When I've done races, I know that when you have your name on the front of your shirt, a lot of spectators cheer for you by name. Since it's his first marathon, I really want him to experience that. I looked at a photo of the shirt he was wearing during his 20-miler, so that I could buy something very similar. 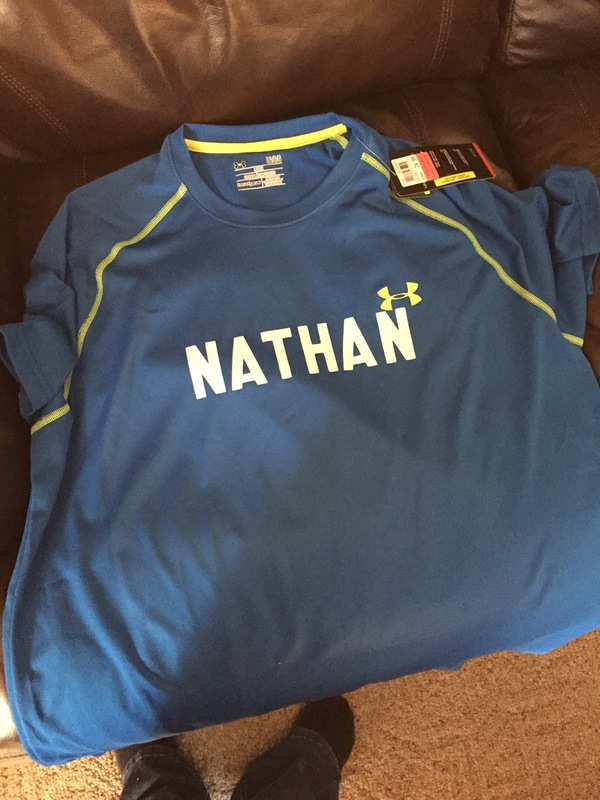 I ended up getting an blue Under Armour shirt, and then I took it to another sports store to get his name on it. I just hoped that he would like it, because I obviously couldn't return the shirt once I got his name on it! The blue is brighter than it looks in this photo (it's more like a royal blue), and I like how it turned out. Congrats Noah!! Good job! And how cool is that shirt! You're right. People will cheer for you by name if they know it and it's a boost! You are such a great sister girl! Way to go Noah! I think it's great that he's staring so young and will hopefully continue on. I wish I had gotten more into sports when I was in school, so I'd be more active today. Way to go Noah! You are doing great. Keep up the good work. It is crazy how fast Naoh is improving! That pic on the top of the hill is awesome! !